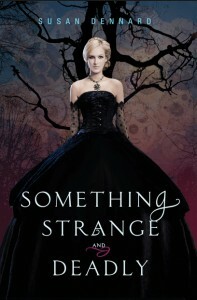 Something Strange and Deadly is an interesting take on the zombie genre. Instead of the zombies you'd find on The Walking Dead, the zombies in this novel are animated corpses controlled by a mysterious Necromancer. The combination of these unusual undead creatures and the petticoats, corsets and parasols of Victorian London, created a captivating backdrop for the story, and one that I'm eager to visit again. Our heroine, Eleanor Fitt, is spunky, stubborn, and determined. She won't take no for an answer, and is willing to disobey social conventions to find the answers that she needs. If that's not awesome enough, she also uses a parasol as her weapon of choice against the horde of zombies that have invaded her city. The secondary characters are just as well fleshed-out and interesting, especially the Spirit Hunters. They have such a fun group dynamic, and I can't wait to find out more about them in subsequent novels. The romance between Eleanor and a particular Spirit Hunter was done quite well and took a backseat to all of the dark magic/zombie madness that was going on. There was no insta-love; rather, their feelings developed slowly as they got to know one another. My only complaint is that the mystery was a bit too predictable. I had guessed the identity of the Necromancer quite early on, and was disappointed to find out that I had guessed correctly. Overall, Something Strange and Deadly was an enjoyable read thanks to the combination of steampunk, zombies, and wonderful characters. I can't wait to see what Eleanor gets up to next!